‘Poptop’ is to ‘Transit’ what ‘elevating roof’ is to ‘panel van’. What a strange statement to start a blog entry with – but I wanted to make it clear from the start that I’ll be talking about elevating roofs in this blog entry rather than a specific manufacturer who happens to have the tradename most associated with them! When I worked for Mercedes-Benz and a customer wanted to know how much our ‘Transit vans’ were (as he pointed to a Sprinter) I got frustrated – but then I just got used to it and went on to explain the benefits and features of the Mercedes-Benz Sprinter over a Ford Transit…. I often feel that it must be like this for Elevating roof manufacturers when someone says “…and I want a poptop roof on it”. In the same spirit as my Mercedes days, I’d like to talk about the features and benefits of our preferred roof type – The Drivelodge Elevator. Here at Thistle Rose Leisure, we can fit any manufacturer’s elevating roof - and there are some good roofs out there, HiLo, Skyline, Austops, Reimo and SCA to name some that we think highly of. However, we happen to think at Thistle Rose that the best elevating roof is manufactured virtually on our doorstep – the Drivelodge roof. So why do we prefer this roof? Well, first of all there's the integrity of the roof frame. It won’t come as any surprise to know that to fit an elevating roof involves cutting virtually the whole roof away – it really is a ‘get it right first time’ job! What’s more, you don’t need to be an expert in thin wall FEA (a very specialised field) to know that when you cut something away you remove the strength. What might surprise a lot of people is just how little is left when you cut out for a roof and windows in a campervan – the picture below shows a van at probably it’s worst point – fully cut out and nothing added back in yet. What about what is put ‘back in’ afterwards? Many roofs come with a frame effectively in 4 pieces – the four pieces are put in separately and typically only joined by a little adhesive and some small rivets. If you took four lengths of steel and put a small rivet in each corner and then picked it up, there’s a strong chance it would just collapse under its own weight. The system integrity is therefore negligible. The 4 pieces cover the hole, but the strength of the cut roof is pretty much as it was before you installed the frame. If you took the same four sections and fully welded them together, you would instil the greatest rigidity and system integrity possible – pick up the frame now and it will remain in its intended shape. The Drivelodge roof comes with a single piece, fully welded frame and thus returns strength to the cut out aperture. What’s more is the Drivelodge frame is made from 3mm RHS – heavier than the typical 1mm steel pressing used in other roofs – but also much stiffer when subjected to torsional loads. The fully welded Drivelodge frame installed. You really can ‘feel’ the difference when you fit the Drivelodge frame as the torsional rigidity of the van is returned. A cross axle jack test will also show that with a Drivelodge roof (as per the original VW van shell), all the doors can be opened with a 150mm diagonal lift – this isn’t something I can say about a lot of other roofs when installed. So what if the van is stiffer? What difference will that make to the operation of the roof or the reliability of my vehicle? Well, the reality is it does make a difference and I’ll explain that later. With some manufacturer’s roofs, they are installed by fitting self-drilling self-tapping screws in to the thin skin of the van roof. These screws are subjected to huge shear and tensile forces when the roof is deployed (add a good Scottish gale into it and the forces are frightening). It’s my opinion that these fixing methods are inadequate – there’s a reason that OEM manufacturers don’t fit load-bearing items to the exterior of their products with self-tapping screws afterall! When we fit a roof we won’t use self-tapping screws into thin sheet metal, we will fit a captive or rivnut in place to spread the load through the thin sheet metal components – this is the same technique that Volkswagen use to fit roof rails. The Drivelodge roof happens to be designed to utilise the existing Volkswagen captive nuts in the roof system – only two more captive nuts need added to install the complete roof. Happy faces when fitting the Drivelodge roof to the VW fixing points. By utilising the VW captive nut system the Drivelodge roof gains another advantage over the competition – accuracy and repeatability. Most other roofs come with instructions on how to ‘set’ and then adjust the roof when installing. Effectively whilst installing, you are finishing the product and making it an ‘individual’ install. Can you imagine what it would be like if Volkswagen’s instructions for fitting a body component – say the tailgate – included phrases like ‘cut and trim the panel to suit’ and ‘fit the tailgate, measure, mark, drill and remove then fit hinges to suit’ in it? Thankfully, when we fit a Drivelodge elevating roof, we tend to bolt it down to the VW captive nuts and pull it down and it just sits right first time, everytime. We’ve never had to trim a Drivelodge roof (over trim the roof and you’re in serious trouble!) nor have we ever had to redrill or adjust the hinges or struts – they just fit neatly and evenly from side to side along their full length everytime! What benefits does this give to the customer? All quality indices have a large weighting on consistency and repeatability. If a roof install relies heavily on the skill of the operative to make it fit and work – where’s the consistency? What happens when the guy who fits the roofs wins the lottery? Is it back to square one again with quality and failure rates? No, with a consistent repeatable product like the Drivelodge roof, the customer gains real benefits in that we can concentrate on the quality of the conversion instead of worrying about ‘making do’. Another benefit that can be seen clearly in the above photo is that all Drivelodge roofs are fitted with a spoiler. This isn’t just a matter of looks – it has real safety implications. If you’re driving into a headwind of 20mph at 70mph that’s a ‘Hurricane’ force wind that’s trying to get under the leading edge of your roof and open it up for you – much better to have a spoiler that diverts that hurricane over the roof and tends to push it down rather than lift it up! Other benefits of the Drivelodge roof include that they sew in elastic seams to ensure that the canvas cannot catch in the rear scissor mechanism – many manufacturers just have a ‘caveat’ in their instruction that the user must ensure that the canvas is clear when pulling down. No comfort to be had when you have a gaping hole in your canvas and the roof manufacturer just points to the instructions and says ‘user error’. This is almost essential if you want a hinged upper bed arrangement. Add to these features that Drivelodge include 2 LED lights in all their roofs, stainless steel hinges, and veltrim pelmets in every roof and the choice really does become simple. To cap it all off, the ultimate benefit for our customer’s is price. The Drivelodge roof isn’t our cheapest option to buy, but it is our cheapest option to sell! We know that we can fit a Drivelodge roof without fudging, fettling and forking – with some roofs there’s another f word involved quite a lot too! We save a considerable amount of time and therefore cost with a Drivelodge roof. In reality it takes 2 man-days less to fit a Drivelodge roof than some of the alternatives. Net result we can install the best roof at the best price, typically £2400 inclusive of VAT with colour coding extra. This is around £1000 less than we charge for supplying and fitting a Poptop roof to the same vehicle. 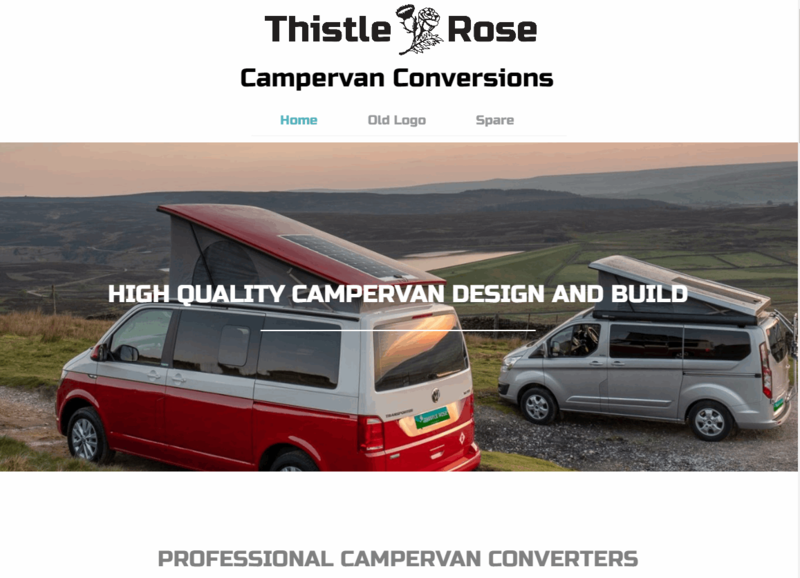 Why not contact us today and ask about having a Drivelodge Elevating Roof installed by Thistle Rose Leisure to your van – we’ll even forgive you if you ask for a Drivelodge poptop!